Despite the backlash, Piers seemed to be enjoying the reaction to his interview. Piers Morgan is being slammed by viewers this evening following his controversial interview with Donald Trump . Some viewers watching the interview, which was televised on ITV were not pleased with Piers’ while others gave him a fair reaction on twitter. Watching @piersmorgan interview with @realDonaldTrump Love or hate them; Piers is very good at interviewing and #Trump is fascinating. 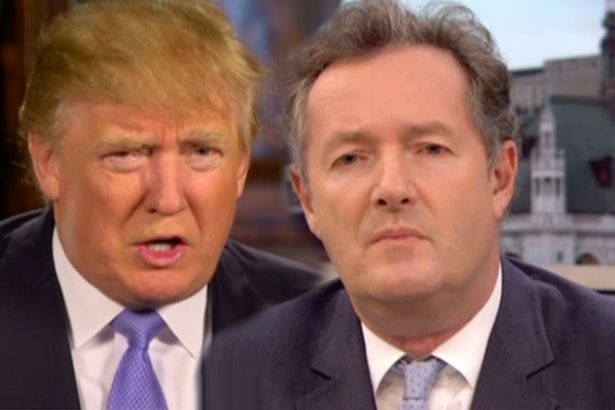 @piersmorgan just saw #MorganTrump & Trump has gone up in my estimation. Try and get him along to a Bunbury game? If he understands cricket! Those tuning into the show were left outraged as the US presidential candidate insisted he wasn’t racist at the same time as calling for Muslims to be temporarily banned from the States. After making the shocking comments, Piers – famous for grilling politicians and celebrities alike – noticeably did not attempt to debate Donald’s views. Donald Trump is a walking sound bite. This Piers Morgan interview is a complete waste of time. Not following-up on any throw away statement. Mark Peachy also tweets, “Watching Piers Morgan interview Donald Trump on itv now – Morgan not even trying to lay a glove on him so far…”.